This piece is contributed by Theodora Scarato, a Prince George’s County parent who has helped to organize Safe Schools for Prince George’s County, an advocacy group that opposes cell towers on school grounds. The opinions expressed here do not necessarily reflect the views of Prince George’s County Advcoates for Better Schools. Seventy-three Prince George’s County Schools are now available as cell tower sites by the Board of Education. Several towers are in the process of permitting and construction. Many parents hear about this plan and instinctively think that it’s a bad idea. Over the last year, I have worked with parents, homeowner asociations, and community organizations that are opposed to these towers. Here is what I learned. I have more questions than answers. The cell tower agreement is a no-bid deal. A Virginia-based company (not minority-owned), Milestone Communications, is the only company that has a leasing deal for towers with Prince George’s County Schools. This agreement was made without bids or RfPs for the best price. There was no competition considered. Why does only Milestone get the leases? How was this no-bid deal hatched? The PGCPS deal allows three cell towers on each school. The master leasing agreement with Milestone allows each school site to have up to three cell towers per school. That makes 219 such towers. The Board of Education voted on the cell tower policy with zero public comment. The November 11, 2010 vote to approve the cell tower deal with Milestone took seconds. All that was up on Board Docs was a one pager — not the lease. Did the Board know exactly what they were voting on? Watch the vote here. The leasing agreement itself was not signed until February 2011. Most parents and neighbors did not find out about this policy until 2014. The leasing agreement was never available online for the public to view. The leasing agreement was only made available via a public information request by a parent in the Maryland Coalition to Stop Cell Towers at Schools in 2014. It still is not available on the PGCPS Board Docs. How could the public comment when there was no lease to look at? The money goes into the PGCPS General Fund. Cell tower monies go into the general fund, not to the individual schools which host the cell tower on site. A February 2014 Audit Report by the Dept of Legislative Services shows that PGCPS was not able to provide key documentation in areas including overtime pay, human resources, bus transportation, and certain contracts worth millions of dollars. PGCPS receives 40% of the revenue from leases. Lease revenue – $12,000 per year, with 3% escalator per year. Lease terms: First term 5 years with up to five (5) five-year extensions. Plus there is a one-time Access Fee paid for First Carrier of $25,000. This means $25,000 when the tower first goes up. With a 30 year lease, that is the equivalent of 833 dollars more per year or 69 dollars a month. Cell towers are ugly and lower property values. Research shows a drop of up to 20% in home values in the vicinity of the tower. Home buyers do not want to buy homes with visible cell towers in their view. Schools are often located in residential areas. Shouldn’t these towers be in industrial areas, not in the middle of neighborhoods? Will people want to move to a county peppered with school cell towers? Cell towers pose a number of health and security risks. The US Labor Department and OSHA are calling for better protections for cell tower workers, citing deaths from falls, collapsing towers, and falling objects near cell towers. Cell towers have caught on fire and collapsed, and cell tower compounds are considered hazmat areas due to the lead acid batteries and diesel fuel on the site. Moreover, the towers emit constant non-stop RF radiation which the World Health Organization classifies as a Group 2B possible human carcinogen based on potential links to brain cancer. Research also points to possible genetic damage, sleep issues, headaches and increased immune issues among people living in the vicinity of a cell tower. Read more at Safe Schools for Prince George’s County’s website. Cell towers could bring unscreened strangers to public school playgrounds during school hours. Maintenance workers (third-party contractors) are allowed 24/7 access to the compound and can drive in with trucks at any time. Maintenance is about twice a month per carrier — meaning at least 10 visits a month. 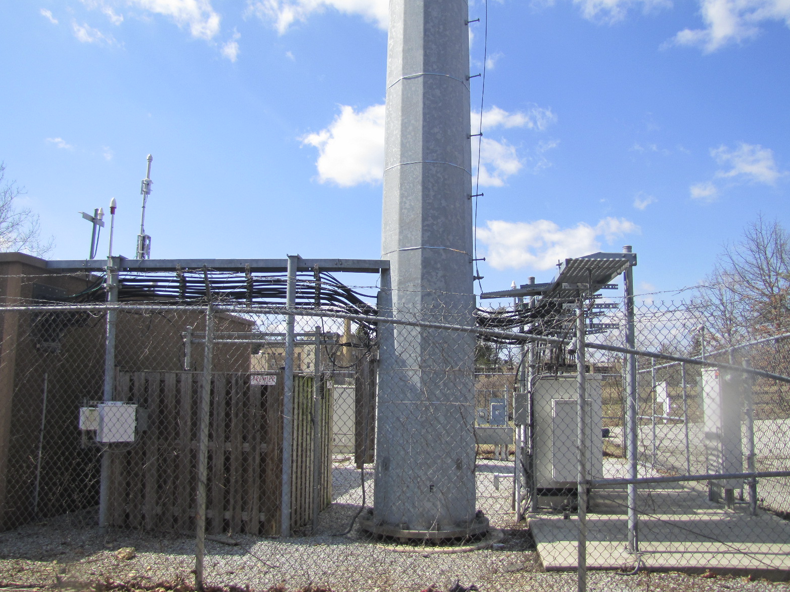 Cell towers are often out of compliance with FCC radiation regulations. A recent Wall Street Journal investigation found that many cell antennas emit radiation far higher than FCC regulations. “It’s like having a speed limit and no police,” said Marvin Wessel, an engineer audited thousands of sites and found one in 10 out of compliance. Despite our best efforts, Milestone Communications has declined from specifying how they will ensure FCC compliance measurements. Cell tower placement is an environmental justice issue. Cell towers are disproportionately placed in neighborhoods with higher numbers of minorities and students needing free and reduced meals. In Montgomery County, for example, cell towers are overwhelmingly placed in schools with higher numbers of minorities, and high ESOL and Free lunch rates. Watch this video of Wootton High School (a school in an affluent MCPS neighborhood) where parents gathered to stop a proposed cell tower in its tracks. The tower proposal was removed within 24 hours of the meeting. Has this ever happened in a PGCPS School? No. In contrast, Prince George’s County schools do not hold such school community meetings (as they do in Montgomery County). In fact, emails between Milestone and PG school officials reveal that meetings are specifically requested by Milestone Communications to be held off school grounds in a “neutral location”. (Go to the email chain on page 29.) Parents might be curious as to why these meetings are not held at PGCPS schools? Could it be because then parents might attend the meetings thinking the issue affects their children? The fact is that the PGCPS cell tower off-site “community” meetings have had only a handful of people attend. Some meetings had just one resident attend, according to Milestone’s letter to me. Other districts are taking down cell towers, halting cell tower installations and legislating setbacks from schools and homes. In California’s Alameda Unified School District the school board called to remove its cell phone towers at two schools last year. The Spokane Washington City Council put a moratorium on cell towers. In DeKalb County Georgia contracts for all 9 of the schools originally slated for T Mobile cell towers were dropped. In Santa Fe, New Mexico the board voted unanimously to oppose school cell tower construction. This May, Walnut California’s City Council voted to increase setbacks to 1500 feet from schools and homes after parents and neighbors got organized. These are only a few examples of what is happening around the country. Firefighters do not want cell towers on their stations. The International Association of Firefighters Division of Occupational Health and Safety and Medicine is officially opposed to cell towers on their stations. Los Angeles Fire Captain Dave Gillotte stated the following when cell towers were slated to go on his station this spring, “As firefighters and paramedics, we live in these firehouses. What effect will these towers have on us? What are the risks to our neighbors? It’s a no-brainer that LA County should at least have done a proper study before putting 200-foot high-power microwave antennas on top of our heads.” The firefighters were successful in stopping these towers and the LA supervisors stopped construction because of their advocacy. The LA School District has not only banned cell towers on school grounds but they also have set RF radiation levels at 10,000 less than our government’s 18- year-old and outdated FCC standards in order to “protect children”. The Cell Tower development process has lacked transparency. In November 2014, the Prince George’s Telecommunications Transmission Facility Coordinating Committee was found to be in violation of the Maryland Open Meetings Act by the Maryland Open Meetings Compliance Board. They corrected most (not all) of these issues. It is hard for parents to know what was going on when there were no meeting notices, no meeting location, no agendas, and no minutes available for so long. The Board of Education was also cited for an Open Meetings Violation in April after they did not give me meeting minutes when I requested them in person at their office. The end result to this lack of transparency is that families have been unaware a cell tower is coming to their school. PTAs are finding out about cell towers after leases have been signed. I can attest to personally being in a meeting where the PTA asked Milestone representatives the status of the “proposed” cell tower only to find out that the lease was already signed. The officers of the PTA were completely unaware that a tower was about to be built at their child’s school until that moment. I should also note that a community homeowner association was formally against that particular cell tower, yet I was told that opposition could only be “noted” but “would not stop the tower.” Without a special exception process in place, opposition will not stop a tower in Prince George’s County. Cell towers violate Prince George’s County zoning code: The Special Exception Process is 100% circumvented in Prince George’s County. According to Sec. 27-445.04 of the Prince George’s County Code, these cell towers should go through the special exception process because these cell towers will need more than 4 maintenance visits a year. However, Park and Planning says the county’s code enforcement agents would be required to address the matter after installation. Despite meeting criteria for a special exception, this process is being bypassed. Petition: The Prince George’s Coalition has a petition that has over 1200 signatures. Please consider signing it. Education: Prince George’s County groups helped form the Maryland Coalition to Halt Cell Towers at Schools in 2014, and they have been working to raise awareness and support legislation to stop these school cell towers. They are glad to talk with PTAs and homeowner associations wanting to know more. Action: The Greenbelt City Council has publicly opposed school cell towers and wrote a letter to the school board calling for more transparency with the cell tower development process. Their action is an excellent model and we recommend people going to their local councils and asking for similar action. Policy: PGCPS parents helped supported recent legislation calling for a moratorium on school cell towers in Anne Arundel County. The Coalition is working with elected officials on legislative actions such as these. Prince George’s County now has 73 schools as “available cell tower sites” with several quickly moving forward to the construction stage. Check out the list of sites here. The schools in development (some with towers up now) are: Tasker, Parkdale, Oxen Hill, Kenmore, Green Valley, Flowers and Burroughs. Even if your school is not on this list now, it may be in the near future as Milestone has all the sites up. All that a wireless company has to do is express interest and the process starts, and there is no special exception process in place so that communities can be a part of the decision-making process. It could happen at any time. The coalition recommends that all Prince George’s County parents and neighbors let their voices be heard now. Read the joint statement of the Maryland Coalition to Halt Cell Towers at Schools: 25 Reasons Cell Towers Have No Place On Schools.